Do you have a computer monitor that you would like to secure through your desk. With the most versatile mounts, you can adjust them quickly to view your files or videos from different heights and angles. With our 7-in-1 base, you can secure your computer display to your desk using bolt through display mounts. Modern computer monitors are larger and made of more fragile materials. Usually, at the office or home, you might want to adjust the height or angle of these displays for better viewing. This is especially true when you have others with you. Some offices might use the same displays for multiple workers. When they have completed a masterpiece, they all might need to see it, at the same time. Adjustable computer displays are also useful when multiple employees use the same workstation on different shifts. Our CotyTech bolt through monitor mounts allow for superior viewing angles. You can even use them at home for family members and friends watching your favorite movies. 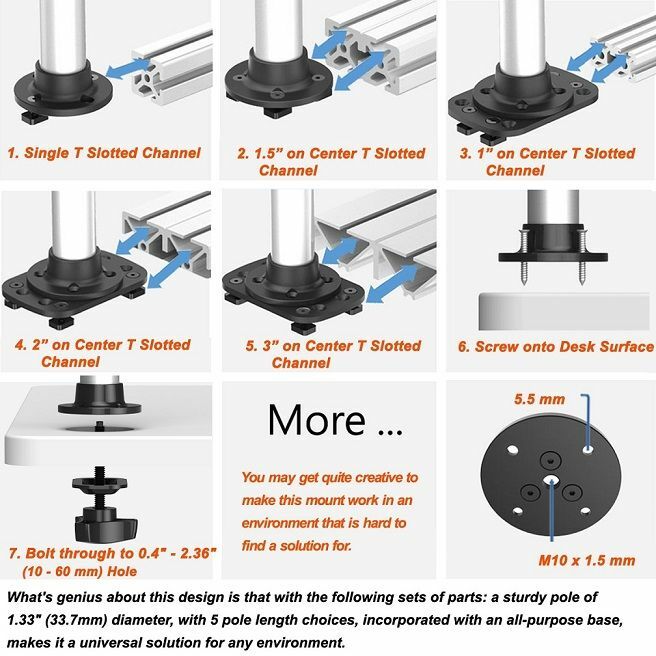 Our new line of tricky application desk mounts includes one for bolting your mount through the desk. It can be used for a pole hole of 0.4 - 2.36 inches (10 - 60 millimeters). When you use one of our CotyTech bolt through monitor mounts, you can move your display to the desired position and leave it. The display will stay in place. Thereafter, you can complete your work in comfort. You don't need to strain your eyes, neck or back. If you are working in front of a computer display for hours, a slight adjustment can prevent you from becoming too tired. There are many dangers for an unsecured monitor: machinery, construction, heavy truck, train and even airplane vibrations. If your office is unstable, you could use our 7-in-1 base with bolt through desk mounts to create a stable foundation. Make it easier on your eyes, neck and back with our CotyTech 7-in-1 base for computer display viewing. We manufacture ergonomically superior products to optimize your comfort. A secure bolt through your desk allows you to adjust the angle or height for the most comfortable viewing. This can increase your work productivity or social viewing pleasure. Our CotyTech adjustable bolt through desk mounts provide you with solid ergonomic solutions. Trust in the experts for securing your valuable displays and monitors: CotyTech.